One of our old favorite meals from way back before the kids were born was a chicken dijon stew from Cooking Light. I was always incredibly impressed with myself when I ate it because it not only called for Dijon mustard as a predominant flavor, it also included chicken thighs along breast meat, and like many picky eaters, I avoided dark meat chicken like the plague. Thinking back, this recipe may even have constituted my introduction to both leeks and kale as well! Cooking Light is no longer a go-to source of recipes for me, and considering the nutritional sea-change that in underway regarding the health value of saturated fat and other previously demonized lipids, the magazine may well need to reconsider its core premise in order to stay relevant. That said, some of their old recipes like this chicken stew have excellent flavor profiles that can successfully be adapted to reduce their carbohydrate content and boost fats. Coming off of a nasty cold this past week, chicken soup sounded really good to me. We had the dark-meat half of a roasted chicken leftover from the previous night, and half a bunch of kale that had been ignored while I was sick, so my thoughts went immediately to this chicken stew. 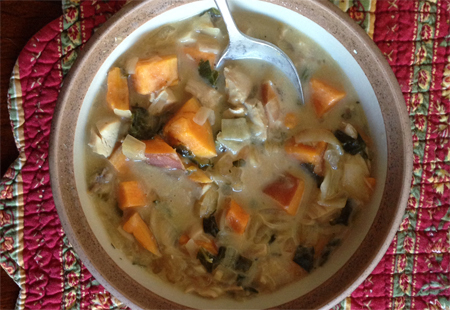 Between changing the ingredients to suit what I had on hand, and customizing them further for our nutritional needs, I ended up with a soup that retained just the flavor backbone of the original: chicken thighs, kale, and Dijon mustard. A baby-food note: I cooked several large sticks of sweet potato in the stock along with the cubes, and then fished them out before adding the remaining ingredients. Tender, infused with nutrient-dense bone broth, and sized right for little fists, 8-month old Theo gobbled up a chunk of sweet potato and a slice of moist roasted chicken for his dinner. Even though he has no teeth yet, Theo has been showing strong preferences for tackling chunks of food rather than creamy purees or very small diced items, so I have started going with baby-led weaning in the area of texture. I make sure everything is soft enough for him to mash with his gums and watch him very closely as he eats. He has a sensitive gag reflex, but is starting to learn how to use his tongue to move foods around in his mouth; if he seems to be struggling with anything, I immediately remove it from his mouth and change tactics. If you are uncomfortable giving whole chunks of food to your baby, you could either use a mesh feeder or puree some onion, garlic, chicken and sweet potato with broth to feed with a spoon. Theo does like broth on a spoon, but since I always have a wide variety of bone broth in the freezer (and frequently simmering in the VitaClay also), I didn’t worry about saving him any liquid from the actual soup. Heat the olive oil or chicken fat in a large soup pot or Dutch oven and saute the onion and garlic until tender. Add the sweet potato, chicken stock, bay leaf, and thyme; bring to a boil, reduce heat and cover, and simmer gently for 30 minutes, until sweet potato is soft. Add kale, chicken and Dijon; simmer for another 10 minutes until kale is tender. Stir in cream, and season to taste with salt and pepper. Source: Heavily adapted from Cooking Light.